Many of you folks who are fascinated by option writing must first know that it is a complex game that requires speed, discipline and nerves. It is not a game that everyone can play. This setup is for you folks to practice on paper and understand the nuances. Know that it can take you more than a month to get the grasp of how options tick. 1. This setup is for learning purposes. 2. Option writing is a risky game, and therefore this setup holds good for between 15 minutes to the end of the trading day. Positions must not be carried over. 3. Positions must be monitored continuously. 4 SLs must be followed strictly. 1. 10 Period EMA: Use it to figure out the trend for the day. If the price remains above it, the trend is bullish, and bearish if the price remains below it. Any price crossovers should be interpreted as change in intra-day short term trend, either bullish or bearish, as the case may be. 2. VWAP: Use it to confirm the 10 EMA signals. Same interpretation as the EMA. Same interpretation for any price crossovers. Know that the signals generated by crossovers from 50 DMA will linger for a longer while than the crossovers from the 10 EMA. Firstly, please know how the DMI works. 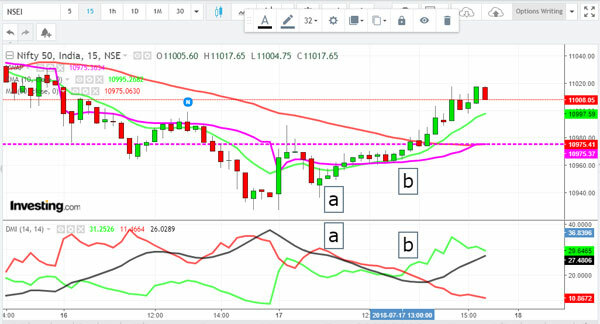 If you have read the article linked above, you will be aware that when the DI+ line starts moving up, it indicates a bullish trend, and when it falls, it is a bearish signal. When the DI- line starts rising, it indicates a bearish trend, and when it falls, it is a bullish signal. The black line is the ADX (Average Directional Index) line. It indicates the strength of the trend. If it crosses above 25, the trend picks up strength, and if the ADX keeps rising the trend keeps getting stronger. 2-3 indicators must be used to confirm the trend before you enter into a paper trade. Only Out-of-the-Money Options must be written after reading the indicators’ signals. The closer these are to the expiry, the better, because the time will keep decaying the premium. As this guide requires you to square up positions intra day, you should work with 15 minute and 30 minute candle charts. At the maximum, you can work with 1 Hour charts, but then you will miss out on many trades, and perhaps enter late. Do not be in a rush and start writing options at the open. Wait for the trend to set in. You should watch till around 10.30 to 11 AM and then decide if the trend has set in. Sometimes you will get a trade very late, perhaps after 1 PM. The Nifty gave 2 chances today to write Put options (PEs) and both chances would have resulted in solid gains. At this time pro options writers would have written out-of-the-money PEs. As you can see the Nifty kept gaining strength and moved quickly from 10950 to 10975. It is a no-brainer that handsome gains would have been made at this point. — the DI+ line crossed above the DI- line. At this time pro options writers would have very aggressively written out-of-the-money PEs. The Nifty kept strengthening and moved from 10975 to 1100 and the move would have made money for options writers. All positions would have been squared up by the end of the day. Okay, this looks easy on the face of it but is not as simple as you think it may be. It requires practice and discipline. Try out the setup on paper and check if it works for you. Maintain a Excel sheet and log in your profits and losses. Review after a month. Do not enter into trades until you are sure of yourself. 13 Comments on "Trade Setup For Options Writers"
sir can this strategy be traded on futres also for intraday ??? This strategy works index options too like NIFTY & BANK NIFTY. Please suggest. Yes, it should. Try paper trades. Good article.Thanks for educating us. Sir, if its intraday why write options. Isn’t better to buy options?